I guess it’s true of most readers. We have these embarrassing gaps in our reading lives, all those books we didn’t get to, the awful holes we hope to one day fill. It’s an impossible task, a job (and a joy) that can never be completed. To that end, I’m currently reading Roald Dahl’s Danny the Champion of the World. I haven’t finished it yet, and I’m disinclined to offer up a review. 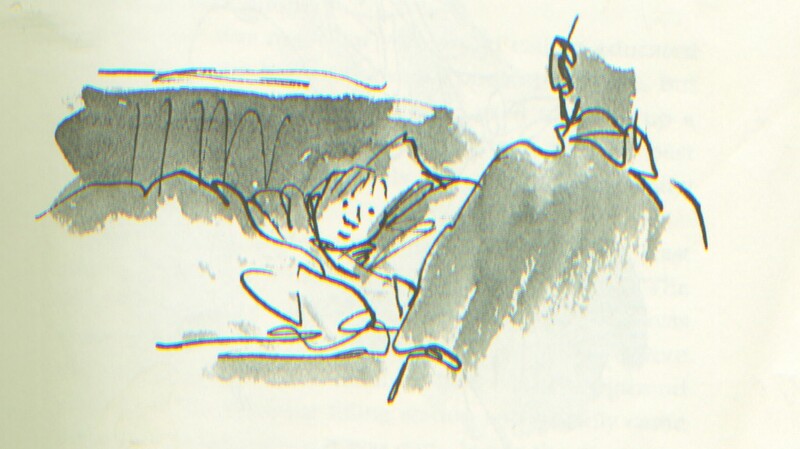 But I wanted to share a few thoughts, beginning with this incredible illustration by Quentin Blake. I keep returning to that page, staring at that picture. Just a few simple lines that capture such depth of feeling. There it all is, being a kid, looking up at a parent with love and wonder while snuggled up warm in bed. Two dots for eyes — two dots! — and yet they seem to express the essence of that relationship. The father registers only as a looming presence without detail, like a great tree in a forest. He is, simply, there. A force of nature and comfort. It’s amazing, I’m stunned by it, in awe of it. So that sums up an important part of today’s blog. Then there’s the storytelling of Mr. Dahl, which is a gift I’ll never have. The man tells stories. Whoppers. But here, today, I want to focus on Dahl’s writing style. I admire the clarity and directness. I’m also charmed by the Englishness — the strangeness to my American ears, the weird things they happily eat, the peculiar names of things — where every detail seems just a little other-worldly, even in a fairly straight-ahead, naturalistic novel such as this one. This is the distance of time and place. A different world, yet still familiar. I really loved living in that gypsy caravan. I loved it especially in the evenings when I was tucked up in my bunk and my father was telling stories. The kerosene lamp was turned low, and I could see lumps of wood glowing red-hot in the old stove, and wonderful it was to be lying there snug and warm in my bunk in that little room. Most wonderful of all was the feeling that when I went to sleep, my father would still be there, very close to me, sitting in his chair by the fire, or lying in the bunk above my own. That paragraph, to me, is absolutely perfect. The writing is direct, specific, concrete (not abstract), interesting (lumps of wood) and for the most part, quite plain. I really loved living in that gypsy caravan. Few would claim that as an example of great writing — except for the obvious fact that, wow, that’s great writing. The absence of flash. An arrow doing its swift work, slicing to the next sentence. The only tricky moment in this paragraph, where the language uplifts and surprises us, giving the reader temporary pause, occurs in that more elaborate third sentence, which was perfectly set-up by the direct predicate-verb structure of the previous two sentences. I really loved, and, I loved. Which leads to this: The kerosene lamp was turned low, and I could see lumps of wood glowing red-hot in the old stove, and wonderful it was to by lying there snug and warm in my bunk in that little room. Again, all I’ve got is wow. There’s so much there, the essence of being loved, of feeling secure, of being a child safe from harm, snug and warm. Can writing really do that? It feels like a small miracle. Is this why I love books? And it all happens on page 7.